At Monteverdi, we believe that Beauty is transformative and has the power to make human beings wiser, more empathetic, more open-minded, and happier. For this reason, we are dedicating a weekend to engaging with the many manifestations of Beauty that surround us in the Val d’Orcia region, from design to music, art to cuisine. Through a series of presentations by interior designer Ilaria Miani, winemaker Francesco Illy, filmmaker Marco Filiberti, photographer Pietro Pasolini, Italian branding expert Maurizio di Robilant, and others, we will explore the culture of Italian beauty more deeply. Set against one of the world’s most marvelous landscapes, the Val d’Orcia region of Tuscany, guests will be able to experience, reflect on, and celebrate Beauty in its many forms. Beauty is Italy’s most characteristic and most valuable resource. To celebrate Beauty is to enrich Italy’s future. Pietro Pasolini was born in Brazil in 1992. After growing up in Rome, he moved to London where he studied documentary photography at Saint Martin’s University. Following his vocation, he set out to document the lives of ethnic minorities and tribal groups across the Asian continent. In 2016 Pasolini moved to New York to study at the International Center of Photography (ICP). While in the US, Pasolini’s work underwent a considerable change, evolving into a careful reflection on the way we perceive and accept our surroundings. His practice questions the notion of reality as objective truth, presenting it instead as an “ever-changing vortex”. Impermanence and vulnerability, essential characteristics of life, become the focus of his work that, through the choice of precarious materials, is predisposed to be reinterpreted throughout time. Pasolini’s works are born through a close cooperation between the artist and nature, and it is the proximity with the impermanence of the natural world that gives some of his works an evolutionary essence. He currently lives and works between New York, New Delhi, and Capalbio. Pasolini comes to Monteverdi to present a collection of photos focusing on the Val d’Orcian landscape, taken using infrared light and long exposure techniques. Ilaria Miani worked side by side with Michael L. Cioffi during the restoration of the village of Castiglioncello del Trinoro. Strict avoidance of the folkloristic approach to restoration, which has turned many historic Italian villages into tourist clichés, was essential in Miani’s practice. For Miani, historic construction techniques are not only employed for maintaining authenticity, but also a part of a sympathetic method for the revival and conservation of the village. The villas and rooms at Monteverdi Tuscany retained their original layouts, and great care was exercised to ensure that function and design were combined to offer timeless, sophisticated comfort. Francesco Illy is the eldest son of the third generation of the Illy coffee family. He is a photographer and art lover who, over time, fell in love with the landscape around the Montalcino region of Tuscany. In 1998 he bought Podere Le Ripi —130 acres that include forests, olive groves and loam, clay and limestone slopes ideal for vineyards. With a long appreciation of wine benchmarks such as Gaja, Giuseppe Mascarello, and Domaine de la Romanée-Conti to inspire him, he started planting two years later, about 5 acres of Sangiovese at first. In 2003, he began producing a Brunello di Montalcino called Lupi e Sirene. Over time, his experimental planting techniques have produced some of the most celebrated wines of the region. development in accord with the ethical and artistic core values of his artistic vision. In 2013, he founded LE VIE DEL TEATRO in Terra di Siena, a non-profit cultural association of international breadth that has gained immediate distinction for its fundamental premises, artistic identity, core ethics, masterclasses, all in close relationship with an ideal stage of rare beauty, as well as a World Heritage Site: the Val d’Orcia. Michael L. Cioffi is the founder and owner of Monteverdi Tuscany. He first fell in love with Bella Italia on a post-college tour around Italy. Having studied the Great Books and the Italian Renaissance at the University of Notre Dame, Cioffi was irreversibly captivated by the rich history of Tuscany. This passion for Tuscany was reignited in 2003 when he discovered Castiglioncello del Trinoro, the medieval town that Monteverdi now occupies. At that time, Castiglioncello del Trinoro was beginning to collapse and was in danger of slipping out of history. Inspired by the mystical, tarnished beauty of the place, Cioffi became obsessed with preserving Castiglioncello – a special perch in history that, over the last 30,000 years, has witnessed Neolithic and Bronze Age artists, cave painters on Monte Cetona, ancient Etruscans, Roman columns marching through the Val d’Orcia, pilgrims and popes walking the Via Francigena to Europe, and the great writers, philosophers, scientists and artists of the Renaissance. 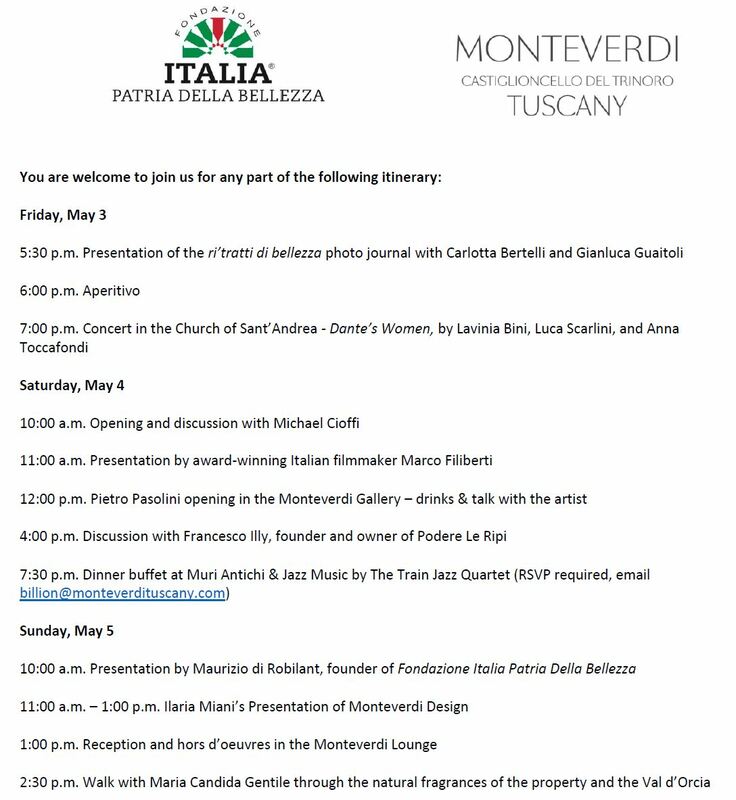 “My vision for Monteverdi,” Cioffi explains, “was to create a place unlike any other – a place of incomparable beauty, stunning architecture and design, all further complemented by the cultural amenities of the visual arts, music, culture and the culinary arts. A place that ignites the physical senses, spirit and mind.” Mr. Cioffi continues to practice law in America and internationally while also tending to one of the great loves of his life – Monteverdi. Maurizio di Robilant is the founder and chairman of the Fondazione Italia Patria Della Bellezza. In 2014, Robilant established the Fondazione Italia Patria Della Bellezza, a foundation born out of the belief that Italy’s beauty – in every sense of the word – is its greatest strength. The Fondazione, in essence, aims to spurn a cultural revolution in Italy, in which Italy’s characteristic talents – design, craftsmanship, fashion, cuisine – can be used to socially and economically propel the country into a new era of development. Robilant works with leaders across Italian industries to transform Italy’s extraordinary beauty and rich history into a strategic resource for the country. For over 30 years, Robilant has led his Milan-based Brand Consulting and Strategic Design firm, RobilantAssociati. Maria Candida Gentile is internationally recognized as one of the most lauded perfumers in the world. She is the only woman and the only Italian to graduate from the prestigious Grasse Institute of Perfumery, where she developed a profound interest in alchemy and the healing power of fragrance. In addition to her own fragrance line, she is the genius behind personal fragrances created for Madonna and Princess Caroline of Monaco. When it came to creating a signature scent for Monteverdi, Mme. Candida Gentile immersed herself in the property and the surrounding Val d’Orcia and was inspired by the positive energy and the connection she felt. “I tried to interpret the spirit of the place by getting close to the natural surroundings and the history, by reading the stories connected to the place. I studied the territory in great detail, the soil, the earth, as well as the history of the woodland and the castle,” she explains. Carlotta Bertelli is an Italian fine-art, fashion and portrait photographer. Born in Modena 1988, she moved to Milan at the age of twenty to study photography, where she started her career in fashion. In the past 10 years, she has lived and worked between Milan, Paris, New York and Sao Paolo, her work becoming internationally appreciated. A mother and wife, she is now based in Tuscany, where you may see her walking down the road with her rolleiflex. Carlotta is the photographic force behind the ri’tratti di bellezza photo journal, comprised of photos all captured within Castiglioncello del Trinoro. Her sensitivity to energy and human connection allows her to capture the vast richness of small, everyday details. With her husband, art director Gianluca Guaitoli, Carlotta tells the timeless story of Castiglioncello del Trinoro through visual narrative. Gianluca Guaitoli was born in Carpi on May 24th, 1973. After one year studying engineering in university, he was touched by an experience in the backstage of a fashion show in Milan. He decided to quit his studies to pursue his career as a fashion hair-stylist. He enrolled in professional school and began to assist some of the best hair-stylists in the world, including Julien DYs, Eugene Souleman, Luigi Mureno, Didier Malige, Aldo Coppola, and Alessandro Squarza. He has gone on to work with some of the largest fashion brands, publications, and photographers in the world. Guaitoli now lives with his wife Carlotta in the village of Fontevetriana, where they work together on an exploration of the use of the face in portrait photography. This project has been exhibited in various shows both in Italy and internationally. He also works as an art director on a number of projects including the ri’tratti di bellezza, a photo journal that showcases beauty and unique slowness of time at Monteverdi. This event is patronized by the Fondazione Italia Patria Della Bellezza. This event is the first in a series. Future events in the series will celebrate many other manifestations of beauty throughout Italy – including works by young Italian poets, contemporary artists, musicians, writers, filmmakers, and scientists.